Bottle cap music maker as seen in Medellin, Colombia. I encountered this bottle cap music maker (for lack of a proper name) at Dulce Jesus Mio, a popular discoteca in Medellin. 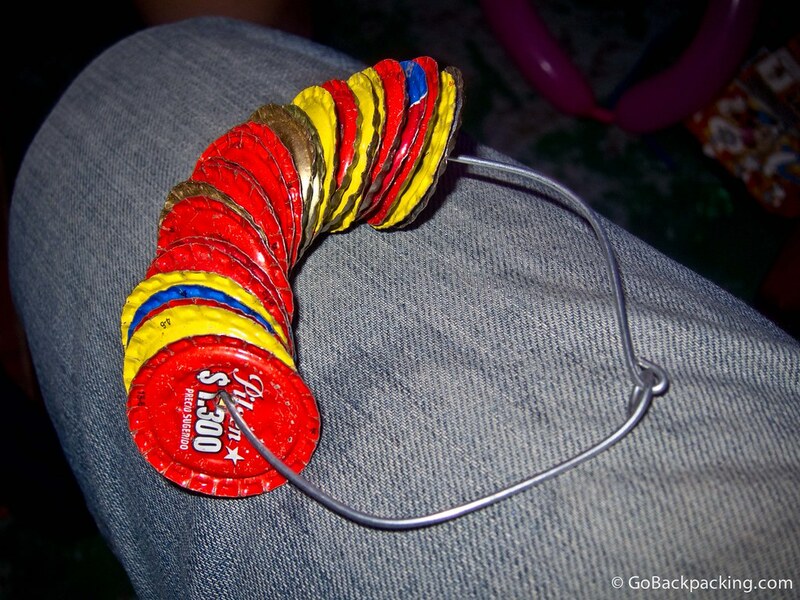 The domestic beer bottle caps are flattened, and then pierced through a wire. When it comes to creating a fun atmosphere, a little ingenuity can go a long way. This is also done in the Philippines. Doh! I suspected Colombia wasn’t the only country, but it was the first time I’d seen it. Ah. I was about to say not only in Colombia because they do something similar in the Canary Islands too ( I have a half written post about homemade/unusual musical instruments), but I see someone has already mentioned that they do it in the Philippines also. They also use those huge seed pods from flamboyant trees, often painting them bright colors, they make a great rhythmic sound! That’s really cool. How is Colombian beer? Very cool. What was your favorite place in Columbia? I’m going to be there for a month in February, kicking off a year-long trip around the world. Right now, I’m starting in Bogota, but would like to visit Medellin and Cartagena (especially with Carnival kicking off at the end of the month). Bogota really only requires a day or two, so unless the city strikes your fancy right away, move on. Cartagena is beautiful, but steamy hot. Barranquilla, a few hours bus ride east on the coast is Colombia’s largest Carnival celebration. I went in 2009 and it’s cool, but not on the scale of Brazil (which I hope to see next year). Make sure to visit some of the pueblos too — that’s where you can get in closer touch with the old, rural Colombian way of life. Guatape/El Penol is an easy day trip from Medellin. Salento is in the coffee triangle, and beautiful as well.